..the map was old and the story was twice as old of the confederates hangout here in south louisiana. i planned this hunt and stayed up nights online searching...searching...maps,maps ,maps, stories and archived knowledge of this conflict. Finally..i went to the location and snooped for hours..i finally roamed the dry river bottom of crow creek and my detector sounded...? 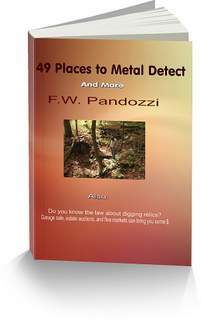 ?i dug trash and debris and horseshoes for three hours before finding an unknown cache of bullets,coins and belt buckles.civil war vets knew of no other place to dig ..but under the earth to secure thier treasure until later. but this was a river bed and it obviously wasnt new and had little errosion over two hundred uears. anyway you slice the ground..it was payday! !Coins, bullets and a dagger from the south....i dont doubt the validity of the story///loot in crow creek river..but the detector and that location will hunt for months to find more.battle grounds are not hunted out forever!! !i know of several...GO HUNT THE GROUNDS!! !if its illeagal...go find another one to hunt! !and Please plug the goffer holes!! !i will report back in july!! !sam lejune- lafayette,louisiana. Comments for " RIVER OF DREAM'S"
Sam, now that you hooked us with your wonderful story, you gotta keep us up to date on what you find when you go back. I also thank you for reminding others about illegal sites, and covering up their holes. We in this hobby have too many against us who want to shut us down. So please be professional everyone. This story reminds me of when I was given permission to detect on private property. I did some research and found that the Native Idians used to roam and live on this property. I did hours and hours of research and found that they would set up camp down by this river that ran through the property. So I got permission and WOW! I found things I never dreamed about. Of course I had to turn them in because of the state laws that I wasn't aware of, ut I had a great time.